Sailfin Pleco, just as the name suggests, has a fin that is shaped like a sail of a yacht. They were discovered by a person named Kner. It is a very beautiful looking fish with unique looking fins. The scientific name of the Sailfin Pleco is Pterygoplichthys gibbiceps, and it belongs to the family Loricariidae. These fishes are easily available in pet stores and online. The price of the fish is affordable, and the daily care for the fish is also not costly. Sailfin Pleco is a fish that eats mostly vegetarian foods; however, they eat dead foods at times, as well. So one cannot totally pin Sailfin Pleco as a herbivorous fish type. This is an omnivorous fish that has an interesting body structure, which is not usually seen amidst fishes. Sailfin Plecos are largely found in the countries like Brazil Ecuador, Peru and Venezuela. They are the native fish breed that comes from the basins of the Orinoco and Amazon rivers. The Sailfin Pleco is also known by other names like clown Pleco, Leopard Pleco, Gibby, etc. The Sailfin Plecosare a type of catfish which look very handsome because of the spots on their skin. They grow into pretty big fishes.They are also used by aquarists in the aquarium as they are an eye catchy fish. While buying this fish, you should bear in mind that they are nocturnal and that they are very active all through the night. They are great fishes to be kept as a pet as they are very charming and belong to apeaceful community of fishes. They get along with their tank mates very easily and are not a threat to other smaller fishes in the tank. The Sailfin Pleco is a big fish, and it needs a bigger tank than most of the other pet fishes when they become adults. They grow to a maximum length of 19.7 inches, which is quite long, indeed! The Sailfin Plecos have a good elongated body structure, which is covered in bony plate-like structures known as armored clad scales. The Sailfin Plecos have a huge head and tiny eyes. The eyes are placed very high on their head which helps them to see clearly in the dark. These fishes grow long and live long when they are left to grow in their natural habitats. They don’t really grow to their full potential and do not live long if they are being grown in captivity. The Sailfin Plecos have a dark brown colored body which makes the spots on them look very obvious. These Plecos have a skin that looks like a leopard skin as they are brown and covered with spots. They get the names Leopard Pleco and Clown Pleco because of the spots on their body. The juvenile Plecos also have the same color as an adult Pleco; they don’t change color as they grow and their color intensity remain the same almost through the entirety of their life. Yet another unique feature of a Sailfin Pleco is that they have a beautiful dorsal fin, which is similar to that of a marine sailfish. They also have rays on their dorsal fin which are different from that of other fishes. There are more than 10 rays on the dorsal fin of the Pleco. Sailfin Pleco is a fish that is unique from others, in terms of its lifespan. The Sailfin Pleco lives longer when they grow in the place where they naturally grown, but its life span reduces when it is bred in captivity. They live for as long as 20 years when they are left to live in the wild where they belong. However, their life span drops to 10 or 15 years when they are bred in an aquarium. The Sailfin Pleco is an omnivorous fish which feeds on plants as well as animals for a living. It mostly feeds on algae when it grows on its natural habitat, and feeds on only dead bodies of animals rarely. Even though most of its diet consists of algae, it is termed as an omnivore because of this feature. The diet of a Sailfin Pleco, when being kept as a pet, should mostly contain algae or algae-based food. Feeding the Sailfin Pleco is easier than feeding other fishes as the diet of this fish is not as complicated as that of many other fishes. This is also one of the main reasons why the Sailfin Pleco is one of the easiest fishes to be maintained a pet. Also, this would be a great fish for a beginner as there are not many complications when it comes to feeding and maintaining a Sailfin Pleco. The owner of the Sailfin Pleco can add a log of wood as a decoration for the tank that holds the fish. The log will have two utilities. Firstly, it will act as a decoration for the tank. Secondly, it will also be generating algae which will be the food for the Pleco, and the cellulose contained in the wood will greatly help in the digestion for the Pleco. 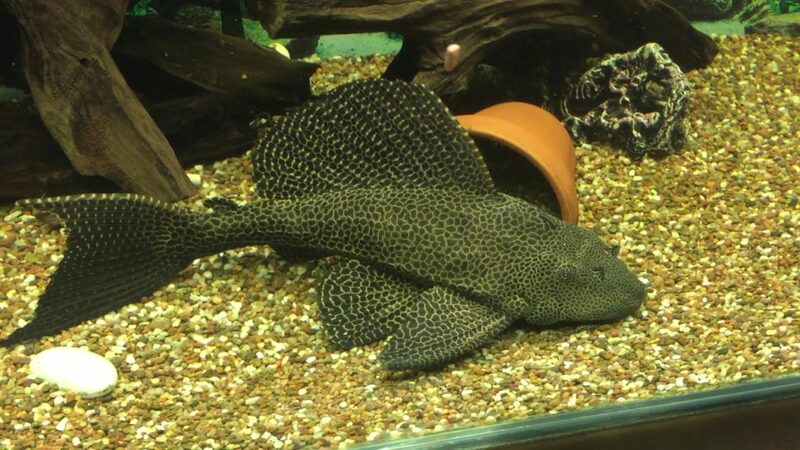 The Pleco feeds on algae, algae-based foods, fish pellets, and dead meat. However they do not have flake foods in their diet and so, it is advised not to feed them flake foods. Providing care for Sailfin Pleco is pretty simple as compared to other fishes which have complex diet patterns and require a high degree of maintenance, the Sailfin Pleco needs feeding only when the algae level goes down in the tank. One needs to feed the Pleco once or twice a week depending upon the algae growth in the tank. If the algae growth is sufficient enough they can just feed it once a week. The Pleco being algae eating fish excretes quite often. They also tend to eat the excreted substance, which is not good for their health. So, the owner of a Sailfin Pleco has to clean the tank every now and then. To be approximate one has to clean the tank once every week. The tank would need regular cleaning, and there should be a proper filter so that the water is clean and able to sustain the life of the Pleco. This catfish breed of fish is very sensitive and is very hard to give medication to. Therefore, the owner should be very proactive in not letting any disease affecting the Plecos. Else, they will have a tough time making the pets take their medications properly. The medication should be given in the correct proportions;otherwise, the entire purpose of giving medications to your Plecos is defeated. The plants that are put inside the tank should be clean and healthy, as the Plecos might start eating the plants once they start growing up. And any plastic plants that are used for decorations should be removed once the Pleco reaches the juvenile stage of its life. The raising of Pleco as a pet is an easy task; however, the breeding of a Pleco is not an easy one. Only a trained eye can find out the difference between the male and the female Pleco. The male Pleco has a little protrusion as its genitalia in its undercarriage, whereas the female Pleco either has a minute recession or it will have flat genitalia. The breeding of Plecos is a difficult thing to do, and so they are done on a commercial basis. The breeding is done by putting Plecos in a large commercial fishery pond. There will be an artificial spawning bed created for the Plecos to mate. The SailfinPlecos mate in muddy water. In their natural habitat, the water would be muddy because they live near the sides of rivers. One thing that should be noted is that it is tough to make the Plecos mate in its natural habitat and so the mating is largely done in an artificial way. This is done by putting them in a commercial fishery pond. The Sailfin Pleco is a big fish so they would need a large tank to hold them. They grow up to a length of 50cm (19 – 20 inches). They would require a tank that has a capacity of 100 gallons or more so that they could swim around without any distress. The bigger the tank, the better it is for the sailfin Pleco as they would have more moving space. The tank should have thick glasses so that it holds the Pleco. The tank should be filled with decorations so that the Plecos feel like they are in their natural habitat. The owner should add a piece of wood so that it can act as a natural food generator for the Pleco. The Plecos are fishes that consume algae as food for their routine diet; therefore, by placing the piece of wood, there will be regular food for the Pleco and the owner need not be bothered to feed the Pleco every now and then. The Plecos are nocturnal fish, so, one can have lights or illuminating objects so that the tank is not pitch black during the night and thus the Pleco can have a good time by being lively during its active time of the day. The Pleco can swim around and sustain in any water temperature. They can also live in a tank with normal lighting. The pH level of the water should always be around 6.5 – 8 always for the Pleco to have a good healthy life. The Sailfin Plecos are a very peaceful and cheerful fish, so, they get along well with all the fishes. And unlike other omnivorous fishes, one need not bother about Plecos eating smaller fishes that are put inside the tank with them, as they feed only on dead animals and don’t eat live fishes. The Plecos, in spite of being very friendly and community fishes,do feel threatened when another Pleco is introduced to the tank. They become very territorial and might show distressed behavior. However, when two Plecos are grown together from a very young age, they don’t feel threatened or intimidated at all. So, if you want to grow two Plecos at the same time, you need to ensure that you bring them up together right from the start. The Plecos, which are generally peaceful and friendly in nature, might develop a taste for the slime coating over other fishes that are its tank mates and might become aggressive at times. The fishes that have slimy coating are angelfish and discus which are lateral, large and slow moving. They become aggressive towards these fishes and might even put their lives in danger. So, it is highly advised not to put angelfishes and discus fishes as tank mates with the Sailfin Plecos. Every living being is healthy when they live in their natural habitat. Likewise, the Plecos are also healthy in their natural habitat only. They tend to get afflicted with various types of ailments, once taken away from their natural habitat. However, having said that, we would also like to tell you that the Sailfin Plecos are blessed with naturally good immunity. So, though, they may fall sick at times, it doesn’t happen very frequently. This is why they are not difficult to handle, and they are good for beginners who wish to keep fishes as their pet. The common diseases that affect the Sailfin Pleco are Ich. Apart from the Sailfin Plecos, almost all the other varieties of fishes fall prey to this ailment. This is a disease where white spots start appearing on the scales of the fish. They are easily avoidable by cleaning the tank regularly. The ich can also be easily treated by giving proper medication to the Plecos. The Plecos are fishes which have thin scales, which makes it very difficult to give them medications. One has to be very careful in this process and give medicines in such a way that one doesn’t hurt the fishes. The medicines that contain premafix and melafix can be given to the Plecos commonly to get rid of this ailment. However, medicines with potassium permanganate and copper should be avoided as it might cause lethal health problems for the Sailfin Plecos. One can proactively avoid any health issues from affecting the Sailfin Plecos by giving them proper care, providing them with a clean and well balanced environment to live and feeding them proper food at regular intervals. The Plecos can get easily affected by not having a well-balanced surrounding. They should also have proper tank mates. It is advised not to put a very aggressive fish along with Plecos as the other fish might harm the Plecos and it will create distress for the Sailfin Pleco. Sailfin Plecos are considered a very community- friendly and loving fish as they get along with all types of fish without much trouble. They, however, have territorial and hostile behavior towards their own kind as they might feel threatened about their individuality being lost because of another Pleco in the tank.They are not an aggressive type of fish, so, they can be introduced in a tank with less aggressive fish and smaller fishes, and they will live without any distress or tension. They are nocturnal in nature, so it is advised for the owners of the Pleco fish to feed their Plecos just before they go to bed. It is also advised to have night lights in the tank so that the Plecos can swim around at night without any hassles.The Sailfin Plecos usually swim around the bottom part of the tank. That doesn’t mean they don’t swim anywhere else. They move around the tank, but the bottom part is their favorite portion of the tank. The Sailfin Plecos are the easiest types of fish one can start with, if they aspire to become an aquarist. They can be handled well even by beginners, who have absolutely no experience in handling fishes before. They are very easy to feed and take care of, as they are sturdy and strong fishes. They are not easily prone to ailments as well. Taking care of a Sailfin Pleco is an absolutely delightful activity that acts as a stress-buster for you. This no-nonsense fish will make for a great company for you, thanks to its easy-going behavior. In spite of them being very low-maintenance fishes, it is highly recommended that as the owner, you should watch out for signs of distress, if any. Making simple decisions about the diet, tankmates and the hygiene of the tank can go a long way in making your fish-grooming experience a memorable one.